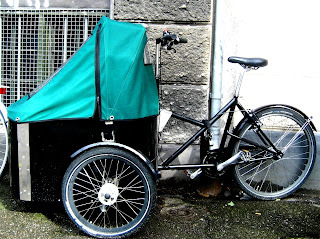 Danish bikes have global reputations, but it is in the cargo bike niche market that things are really moving forward for Danish Design. 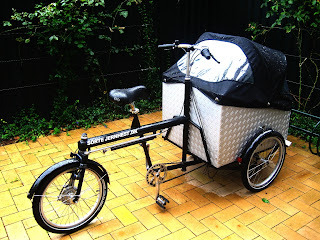 The Nihola is the cargo bike with the most awards and the best reputation. www.nihola.info. Lightweight and roomy, it also comes in varying sizes. It is this bike that has enjoyed a massive export market and it can be seen all over Europe. The Sorte Jernhest [Translation: Black Iron Horse] is a classic. 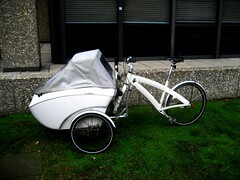 The design is radically different and, despite it's weight, it is a pleasure to ride. The Cash & Carry bike is the cheapest on the market. Doesn't make it great, however. But you see many of them on the streets. The Christiania bike [not pictured] basically started it all on the Danish market. It is much heavier than the present competition but it remains a staple on the streets of Copenhagen. It's a legend in it's own time. Our bike culture has come a long way over the past century and a bit. Back in the day, in the late 1800's, riding bikes was not considered cool. Cyclists were spit on and heckled [kind of like riding in American cities in 2007...] because cycling was viewed as a disturbance. Indeed, cycling in some Danish cities was illegal. The town of Slagelse, for example, first legalised cycling in 1885. Since then, however, we've gone from strength to strength, creating one of the world's leading bike nations and the world's foremost bike city - Copenhagen. 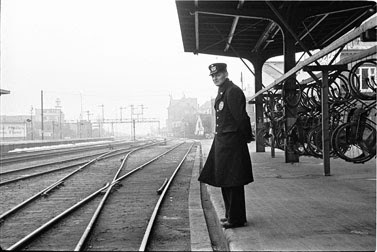 Above: The train station in Odense, Denmark in the 1940's. Note the bike racks on the right. The same as these ones in a Copenhagen backyard. 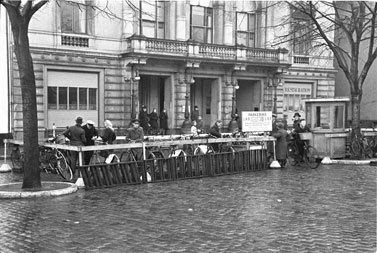 Above: Manned bike parking in Odense, Denmark during WW2. An association that battled unemployment set up safe bike parking facilities so you could leave you bike behind for a cheap price - 25 øre - and not worry about your tyres getting stolen. Rubber was rationed. 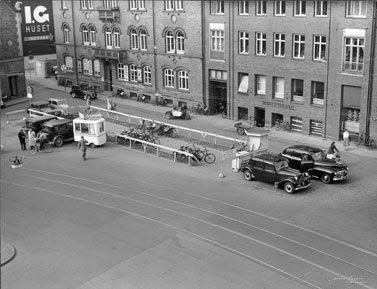 Another manned bike parking area in Odense, Denmark in September 1952. You paid the man in the little wooden shed. Above: You always meet people you know when commuting by bike. One distinct advantage over automotive pursuits. The country's second largest party - The Social Democrats - have announced a plan for improving Denmark's status as a leading cycle nation. 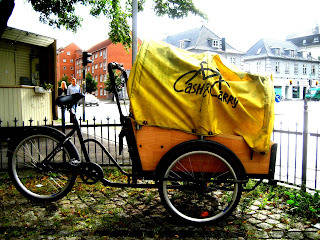 The party aims to invest 1 billion Danish kroner - [135 million euros / 200 million dollars] - over ten years in our already well-established bike culture. The party points to several studies, including a Norwegian one that shows that national investment in cycling infrastructure and culture will earn the state three times as much as their intial investment. This profit comes from less money spent on roads and less money spent on health issues - the more the people ride, the less they suffer from "The American Illness" - obesity - and other lifestyle illnesses like diabetes 2 and heart disease. 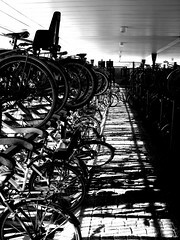 -Aiming to brand Denmark as the world's leading bicycling nation and as the nation in the world that has done the most for advocating bicycling. In Copenhagen there are roads that have excessive amounts of bikes. Over 20,000 bikes between 06:00 and 24:00. Creating dedicated bike motorways will make it easier and quicker to ride through the city. 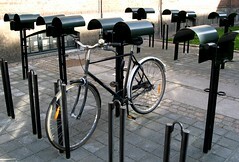 - Better parking facilites for bikes in the big cities and for commuters. - More and better bike lanes/paths. - Making it free to take bikes on trains and busses. At the moment there is a fee for taking bikes on trains - 2 dollars in Copenhagen. - Service stations at busy train and bus stations. 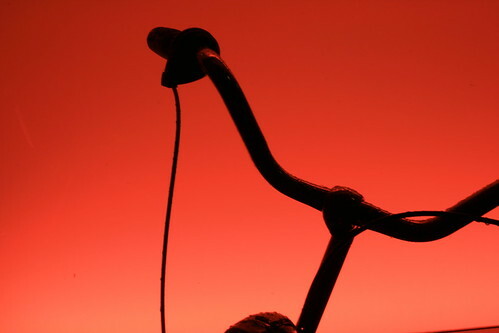 Many people don't ride their bikes because they're not fixed. Establishing service centres wiill give them the chance to have their bikes repaired while they're at work or school. - Increased safety in traffic. All very interesting, all very promising. It is, however, a political party so let's see what they actually do with the proposal. 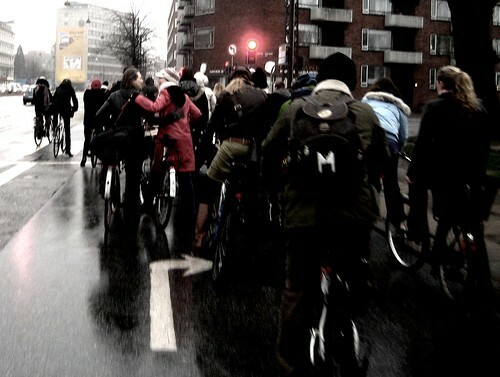 All in all it shows how important the bike is for Denmark and Copenhagen. tags: "bike infrastructure", "bike politics", "bike rush hour", "bike statistics"
"Last year a survey found Denmark to be the happiest place in the world, based on standards of health, welfare, and education. Now the country's capital is ranked the second most liveable city in the world by the esteemed Monocle magazine. When it comes to quality of life, Copenhagen is pretty hard to beat. 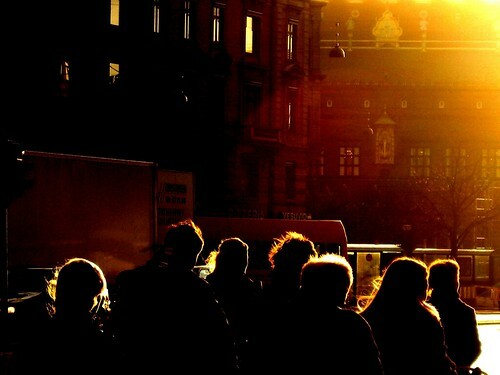 In fact, only Munich does better in Monocle magazine's recently published survey of the world's most liveable cities. To sum up the spirit of the Danish capital, Monocle writer Stuart Husband quotes the advertising slogan "there's something modern in the state of Denmark", which in his view "encapsulates Copenhagen's current mood of creative maelstrom and youthful dynamism rather adroitly". Contributing to this sense of dynamic modernity is the new wave of architects, designers and chefs - combined with "some joined-up thinking by city officials" - which has seen Copenhagen reborn with "a bullish mood". Monocle lists a number of 'metrics' that contribute to Copenhagen's high placing. They include public transport, the extension at the city's airport, the freshly-minted statement buildings lining the harbour, a well developed bicycle network, the café culture, the neither harried nor sleepy pace and design and creativity." A little mood piece about cycling in Copenhagen. 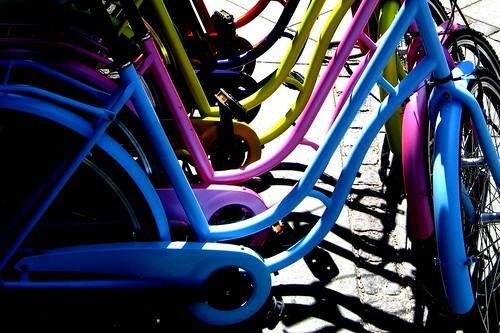 Bikeshop Rainbow, originally uploaded by [Zakkaliciousness]. Here are some colourful models on sale outside a bikeshop. We call these models "Grandma bikes", for ladies. Oddly it's taken a century for bike manufacturers to start producing bikes in colours other than black or brown. Nice to see more colours on the streets. You get that old school cool feeling with the pleasure of riding a spanking new bike. The Copenhagen City City Council had the consultancy company Trafitec to rate the societal and health aspects of our bicycle culture. The figures are specific to Copenhagen, based on our current levels of health and welfare, but the results and stats are fascinating. Physically active people live ca. 5 years longer than physically inactive. Physically inactive persons suffer on average for four more years from lengthy illnesses. Cycling has the same effect on health as other types of excercise. Four hours of cycling a week, or roughly 10 km a day is a fitting level - luckily this is the average bike usage in Copenhagen - back and forth to work and running errands. The study from Trafitec shows that 1 extra cycle kilometre produces, on average, 5 kroner [1 dollar] in health and production bonus for society. Increased cycling levels in Copenhagen therefore has a great potential for improving our health levels. Here are two scenarios that illustrate the positive connection between cycling, health and economy. -This would be an increase of 41 million extra cycling kilometres each year. - There would be 57,000 fewer sick days in the workplace each year. That would be a reduction of 3.3%. - 46,000 fewer years with lenghty illnesses. Building bike lanes on streets with an average of 2,500 bikes and 10,000 cars each day would bring 18-20% more bikes on the stretch of road. Including a drop of 9-10% in the number of cars and 9-10% fewer accidents and injury. - A saving of 246,000 kroner in the health sector. - A saving of of 643,000 kroner in lost production. - The extra kilometre would give 170,000 more cycle kilometres each years. All that from one extra kilometre of bike lane. Okay, okay, maybe all these stats are a bit boring... but I find them interesting. But remember you can always pop over to the Cycle Chic for a little respite from the stats. The map of Greater Copenhagen is from the Bicycle Audit 2006 [Cykelregnskab 2006] from Copenhagen City Council. It shows how many bikes are on the bike lanes and streets each day between 06:00 and 18:00. The thickest red lines show that over 20,000 bikes are using the infrastructure on those routes. Indeed, rush hour on bikes is something you see on weekdays. 100+ bikes lined up at traffic lights on the bike lanes, waiting to move towards or away from work or school. For reference, there are over 500,000 cyclists on the streets every day. 36% of 1.7 million citizens. Not for nothing are city councils around the world talking (dreaming) of "copenhagenizing" their cities by planning (hopefully) bike lanes and bike infrastructure. For more info, stats and inspiration, see the Blog Categories links on the right column. tags: "bike infrastructure", "bike rush hour", "bike statistics"
Sunrise Movement in Concerto, originally uploaded by [Zakkaliciousness]. The Copenhagen City Council produces a Bike Audit every couple of years in order to track bicycle usage in the city and plan more bike lanes and other infrastructure. When they compare the 2006 Audit [Cykelregnskab 2006] with the one from 2004 it shows that the average amount of kilometres the average Copenhagener rides is unchanged. 1.2 million km each day. 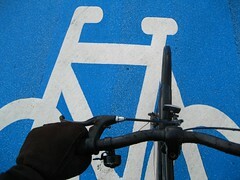 Around 50% of cyclists ride up to 50 km each week. Then there is a group of 15% who ride more than 100 km each week. 34% ride up to 30 km a week to work. 68% ride up to 30 km a week on non-work related errands. 17% ride up to 30 km a week for recreation. The latter means that 73% use their bikes for non-recreative usage. It is a means of transport, first and foremost, and not a conscious fitness-related vechicle. 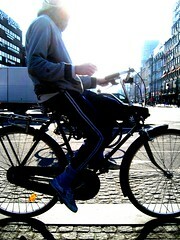 That cycling is a good form of exercise, however, is the most important reason for riding for 19% of Copenhageners. Another 38% mention excercise as one of the reasons. In comparison, 51% of people say they ride because it is easiest and 45% say they ride because it is fastest. 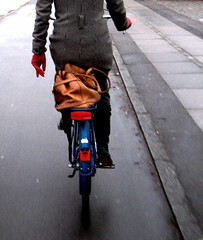 In 2006, 36% of Copenhageners rode to work. The goal in the City's Cycle Policy is that 50% of the citizens will ride to work and educational institutions. The goal was previously 40% but has now been raised. The City cites that improved infrastructure, including better controlled bike parking facilities are necessary if the magic 50% goal is to be reached. 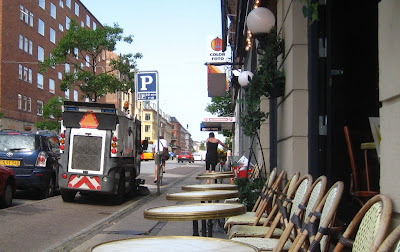 tags: "bike infrastructure", "bike statistics"
I love these groovy little street sweepers. They are designed to fit perfectly on the bike lanes of the city. In the winter they also have snowplough versions in the same size that keep the bike lanes clear. Another example of how an established bicycle culture breeds the necessity of developing relevant gadgets to maintain them. My Town, originally uploaded by [Zakkaliciousness] View of City Hall Square from the City Hall Tower. 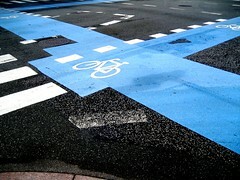 The blue pavement are bike lanes. Last week the police in the capital had a campaign against marauding cylists. The good thing is that you hear about it in advance in the press but nevertheless 777 cyclists were stopped and fined for traffic violations. A fine will set you back 250 Danish kroner. About €40. That's for each infraction. 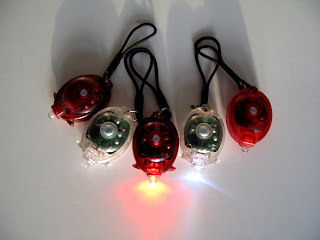 If you forget both front and back lights, for example, it's double up. 360 were colourblind. The majority of the fines were handed out to cyclists who ran the red light. 128 of them rode the wrong way on a one-way street. 70 were caught without bike lights on after dark - despite the fact that the sun sets at 22:00 and rises again at around 04:30. 26 for riding in the zebra crossing. 44 were in the wrong place on the lane when they turned. It's worth mentioning that it's 777 tickets out of a few hundred thousands cyclists. 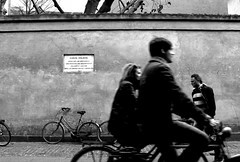 There is a tendency among many cyclists to interpret the law in a more casual manner. A few ride like morons but when you have half a million bikes on the roads each day, you expect some morons in the crowd.The Danish Cyclist Union has tried to get the police to use dialogue instead of fines and zero tolerance. To which the police commisioner responded, "We've tried dialogue, now it's time for fines". Bike 1, originally uploaded by Annelogue. This is a photo from another Copenhagen Flickrite - Annelogue. For some reason, out of the blue (or red?) I remembered this shot yesterday - from ages and ages ago. I scoured my Favourites and was thrilled to find it again. It's just as I remember it. A beautiful shot but all the more beautiful because it is completely scented with Copenhageniciousness. Be sure to click on the photo to see it it's full size - I don't know why photos appear like this when I blog them. When you live in a country so completely saturated with bike culture it is often fun to see the details. Once your bike infrastructure is in place, it's time to get creative. 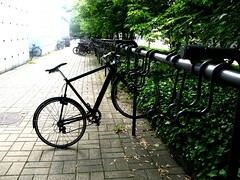 Bike racks are, in many ways, merely functional devices for making a bike stand up while you're not on it. Kickstands are standard gear, of course, but when you have - in Copenhagen anyway - 36% of the population commuting by bike each day, you need solid racks to put the bikes in. In the hope - often vain - of maintaining order on the streets. At busy train stations you'll often find double-decker bike parking. Obviously the lower level is first to be filled up but it's no difficult task to hoist your bike up to the next level. 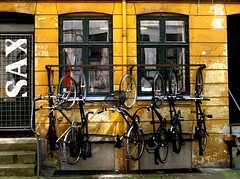 Bike racks can be aesthetically-pleasing to the eye. Here the Danish tradition for cool, functional design comes into play. 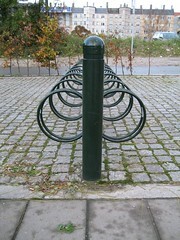 A long line of bike racks outside a college. Just hang your handlebars on the hook and off you go. In a narrow and ancient backyard, this is a creative space management solution. And no wet seats if it rains. No wet seats if it rains here, either. Quaint little roofs cover the seat. 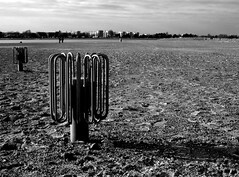 An elegant and functional little bike rack at the beach. It's winter and the rack eagerly awaits the summer hordes. 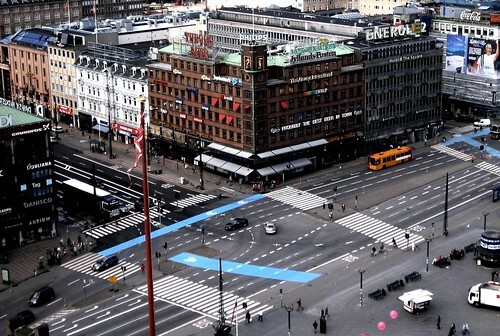 The first step towards Copenhagenizing a city is, of course, investment in bike infrastructure. Trying to encourage people to ride their bikes but not providing them with the necessary infrastructure serves little purpose, in my eyes. In countries that have yet to develop a bike culture the cyclists on the roads are primarily lycra-clad males from an inaccessible sub-culture. I'm sure there are people out there for whom this is a fetish, but for car drivers who harbour thoughts about riding their bikes to work or school it is a stumbling block. In their eyes riding their bike means having to integrate into a closed sub-culture of hard-core bike 'enthusiasts'. In the process they see that they will have to invest in 'fancy' gear and 'cool' bikes. Their old three speed city bike won't suffice. In order to encourage more people to ride it is essential to make it look easy. You don't need lycra. You don't need fancy shoes, shorts, bikes. You only need two hands, two feet and two wheels. Just look to the Danes and the Dutch or any other Northern European country for inspiration. You don't HAVE to look like the Lycra Boys. You have clothes in your closet. Wear them. Get sweaty easy? Ride slower. This cool cat would surely look ridiculous in the lycra outfits you see on the streets of North American cities. No need to look like a sports freak on your way to work. Copenhageners in their natural environment and their natural clothes. I find a sight like this somehow pleasing to the eye. In city councils around the world they speak of "Copenhagenizing" their cities by building better infrastructure for bikes, including the all-important bike lanes. Just read something interesting. How many kilometres do the citizens of various country ride on average each year? 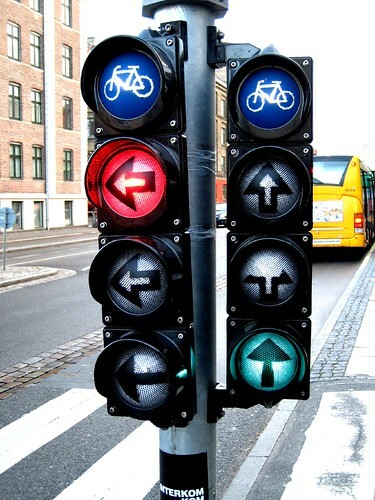 Typical Copenhagen Bike Traffic Light. On many of the busy roads and intersections bike traffic lights are provided for the bike lanes. Like this one on Nordre Fasanvej in Frederiksberg.